You can make these a lot neater then I did. I actually ran out of flour so I was struggling a little but the clear wrap helped a lot. 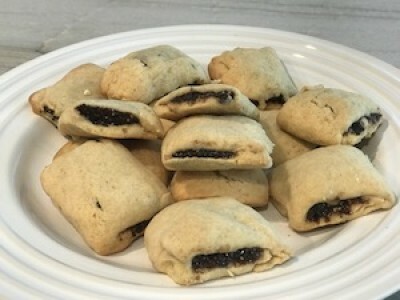 Go to youtube and search for fig newtons and they will show you how to roll the dough. I used a clear wrap on the bottom and the top of my dough. It made it a lot easier to roll. I can't wait to make these again! Chop figs and toss in a small cook top pan. Add in the zest and 1/2 of the juice from the orange. Simmer for 10 minutes over medium-low. Remove from heat and stir in maple syrup and let cool. Once cool put in a blender or mini-chopper and blend until smooth. Put into a zip-lock bag and put in the refrigerator. In a large mixing bowl using an electric mixer beat butter and coconut sugar for about 2 minutes. Add in eggs and remaining orange juice and beat util incorporated. Add almond meal, vanilla, baking soda, cinnamon and salt. Continue beating until a ball forms. Take the dough and wrap in clear plastic as a disk. Refrigerate for 30 minutes. Preheat the oven to 3750 degrees F. Line a baking sheet with parchment paper. Remove the dough from the refrigerator and place onto a sheet of plastic wrap on a large board. Sprinkle some almond meal or tapioca flour. Cut the disk in half. Place one half of the disk in the center of the plastic wrap and top with another piece. Roll to a rectangle about 1/4 inch thick. Cut the edges to get an even rectangle. Press the fig mixture to the corner of the zip-lock bag then snip the corner. Take the filling and pipe it down the middle of the rectangle. Take one end of the dough and fold to cover the filling using the plastic wrap as a helper. Fold again and press gently around he edges to create the form of a cookie. Cut each cookie and place on the parchment paper prepared ban. Do the same with the other half of the dough. Bake for 14-17 minutes; or until golden brown. Store in an airtight container.